Diamondback Airboat Stops By Next Level Inc.
We tuned up the stereo for optimum performance and sound. Wet Sounds makes an amazing marine speaker and paired with a Fusion radio unit will give your boating experience that next level of sound you’ve been looking for. The airboat builders at Diamondback did a great job at creating this beautiful watercraft. They have an eye for detail and the creativity to give this the wow factor. The welding is spot on, the seats are perfect, and the electronics are safe and secure. Lots of little touches around the boat with the Diamondback letters really make this boat stand out from the crowd. A customer brought in a 2005 Formula 240 boat for a stereo upgrade and had questions about SeaDek floor covering. We added to this boat a Fusion MS-UD650, 2 MS-NSX300 wired remotes for the driver and back platform, NRX Controller, a WetSounds 6channel amp, Revo 6″ speakers with a 10″ sub and SeaDek in grey over white. Next Level Inc. is a SeaDek Certified Installer and yes we can travel to the coasts to get to your boat. The MS-NRX300 features a sleek new innovation: the glass helm flush mounting option. You can now choose either a flush mount for a stunning glass helm finish, or you can easily install with the conventional dash mount finish. The REVO Series. The series comes in two sizes, 6.5’’ and 8” models, and both are loaded with industry leading features to be the best speaker on the market. The series comes with 1” Titanium Tweeters for clear high frequency detail, Wet Sounds exclusive Nylas (Nylon reinforced fiberglass) composite frame to withstand the harshest environment. An injected molded advanced composite mid-bass cone for tight bass and distortion free performance. Each speaker comes with RGB LED tweeter glow kit that will allow thousands of color options and with 8 different grill options for both Salt and Fresh water, you can match the look and feel of your boat. The Subwoofer is under the drivers steering column. –@wetsounds speakers and amps everywhere with @rigidindustries lights, @seadek AND more LED. You can see a video of the boat on our Next Level Facebook and Next Level Instagram. About the 12 inch SPL Marine Subwoofer. “SeaDek non-skid, closed cell EVA products offer safe and comfortable alternatives to molded in non-skid, paint-on textures and other marine traction products currently available. From UV protected non-absorbent foam, SeaDek features an innovative, textured micro-dot surface for enhanced non-slip characteristics. How one customer made boating memorable and safer with help from Next Level Inc.
We all know that water makes your boats fiberglass steps very slippery and can be unsafe without a non slipping deck surface. So, we started off this project by quickly installing SeaDek floor padding on the back swim platform, across the entire walking space of the interior of the boat and even on parts of the gunwale. The padded material also gives the boat a nice clean touch that can be easily washed with a garden hose. Plus, SeaDek comes in many different colors and patterns making it easy to match the boat colors. Next, we added color changing *Kicker Audio speakers, ensuring their music sounded the best and will stand up to the Florida weather. Also installed were 4 *Wetsounds REV 8″ wakeboard tower speakers for the rider behind the boat to hear the music. Come in to our shop to see each style for yourself. *All equipment comes with a lifetime installation warranty ONLY when product are purchased through our shop. To have a free estimate on SeaDek, Marine Speakers, and/or LED lighting for your car, truck , or boat, please call us at 407-704-5676. Airboats are fun! We have some boats ourselves that we have installed custom Seadek Non-Skid, waterproof speakers from Wetounds, and Ocean LED and Rigid Industry Lights just like on this customers boat. The customer here asked us to install a screaming and waterproof Wetsounds stereo so their friends can hear the music from across the state. This airboat now has four 10″ speakers and four 8″ color changing Wetsounds speakers, a 10inch sub from Wetsounds, and 2 marine amps to power it all. 2 Rigid Industry square lights were installed around the fan cage as well as more LED lights under the gunwale and in the fan cage. Music can now be controlled from a remote or a smart phone. Lights can also be controlled through a remote and a smart phone. At Next Level Inc., we put pride in our work and treat every customer with a white glove treatment. We make sure that the work done is done right the first time. Call us today to talk to a professional that really knows how to understand what a customer is looking for, and how to manage the project in the right price. If you have any questions about this airboats installation, or will like to have this kind of work done to your toys, we are open Monday – Friday 9am-6pm and Saturday 9am-2pm. Wetsounds – Four 10’s and Four 8’s Installed with Wetsounds Subwoofer. All waterproof! Custom SeaDek with Next Level and Wetsounds Logo on Waterproof Subwoofer. 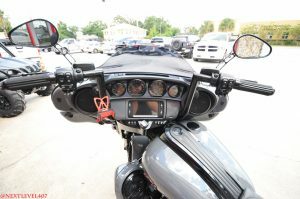 A Customer brought us a Maverick in search of a sound system, the sounds system we thought would fit best was a full WetSound audio system hooked up to a WetSound bluetooth control knob. We used a WetSound HT4 amplifier to power four XS808 8″ convertible component speakers. This whole sound system is hooked up to a WetSound Bluetooth Control Knob that makes picking the right song a a breeze.